Overfishing is catching too much fish. It is a type of overexploitation where fish stocks are reduced to low levels. It is a good example of what is good for the short term is not good for the long term. Also, what is good for some fishermen is not good for all of them (tragedy of the commons). So much fish is caught that the there are too few adults of certain species left. 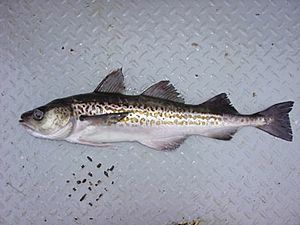 With cod, for example, the greatest production of eggs is from large females. But these are caught, and the average size of spawning females has gone down. Eventually this gets so that the production of eggs is significantly reduced. The artificial selection of large fish has gradually reduced the size of mature females. 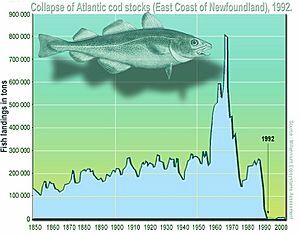 The Northwest Atlantic cod has been regarded as heavily overfished throughout its range, resulting in a crash in the fishery in the United States and Canada during the early 1990s. Consumers can get information about the conservation status of the seafood available to them. Overfishing Facts for Kids. Kiddle Encyclopedia.